The Orange County Business Journal named Pan-Pacific one of Orange County’s best places to work, something we’ve known all along, but we’re happy to be recognized for! 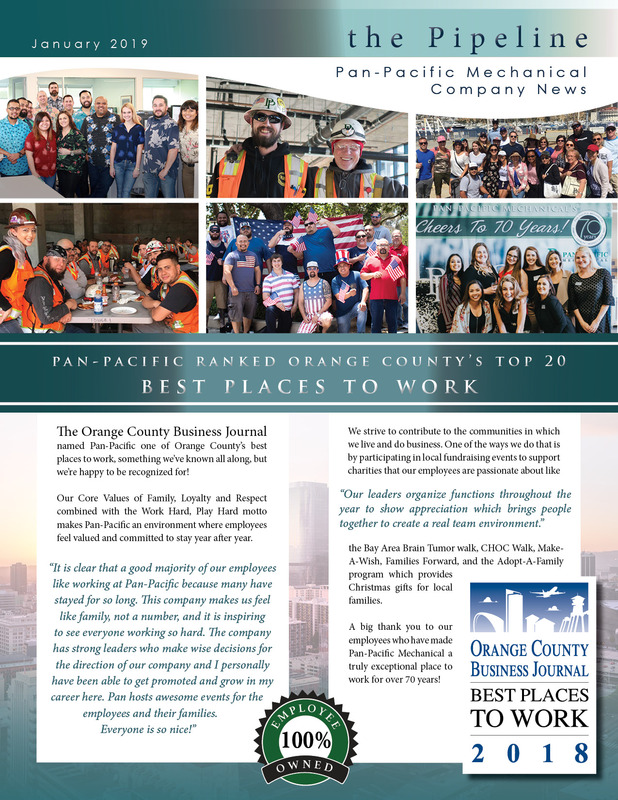 Our Core Values of Family, Loyalty and Respect combined with the Work Hard, Play Hard motto makes Pan-Pacific an environment where employees feel valued and committed to stay year after year. We strive to contribute to the communities in which we live and do business. One of the ways we do that is by participating in local fundraising events to support charities that our employees are passionate about like the Bay Area Brain Tumor walk, CHOC Walk, Make-A-Wish, Families Forward, and the Adopt-A-Family program which provides Christmas gifts for local families. A big thank you to our employees who have made Pan-Pacific Mechanical a truly exceptional place to work for over 70 years!